I believe I made a grave mistake in my cleaning process. In the middle of my cleaning I had compiled this collection of paper journals. These journals sat on my shelf for several days. I stared at them, feeling slightly demotivated every time I did so. I had gone so far as to organize them roughly by year, but I could not begin to imagine actually poring over each book and putting them in some kind of real order. Even the prospect of scanning them seemed daunting. In a cleaning fit, I tore them up and dumped them into the recycling bin. Immediately after I felt saner, cleaner. I walked into my room feeling relief. But now I feel a certain sadness – I wish I had at least scanned them. With my document scanner it would not have truly taken very long, and I could have made a decision about them with a cooler head later. But now they are gone…long gone, maybe already part of a newspaper or cardboard box somewhere. I can’t change that action, but I can temper my behavior in the future. 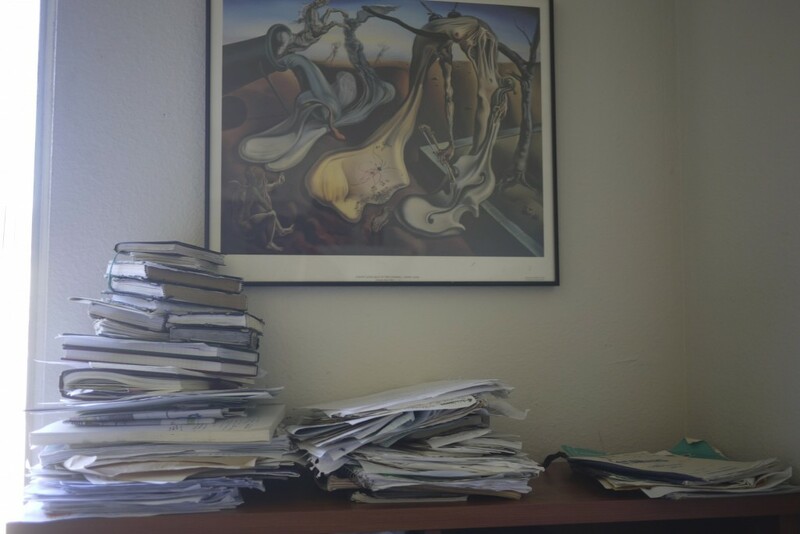 I’ve just now started to organize my digital files and am at the same stage I was at with my journals. They are roughly organized by date, and there are thousands and thousands of them. But this time, if I get fed up with the immense number of files, I will just take a break and walk away instead of letting my frustration get the best of me.